Your DJ / Entertainment can make or break the success of your party. When looking to book your DJ & Entertainment you should consider several factors before signing on the dotted line. How long has the DJ / Business been in operation? Do they have experience of Weddings and Parties? Is Your DJ registered self employed? And registered with HMRC with a ‘Unique Tax Code’ [UTC] If they are a Ltd company or PLC, are they registered at Companies House? Is this a part-time job or ‘hobby’ for the DJ? Some DJs may well have a full-time day job of which their DJ work is subsidised by this … how does this affect a full-time professional DJ? Well some but not all will charge a lower fee because they don’t rely on DJ work income and others – the ‘hobbyist DJ or bedroom DJ’ may not declare their second income to HMRC … this then makes it hard for a full-time professional Wedding DJ to earn a living and it also affects You as a ‘Tax Payer’. How many Weddings and parties have they undertaken and do they have any references, feedback or testimonials to show you? How will Your DJ be attired? How many DJs have you seen at events dressed not to impress? This is Your day, so you should have the decision on how Your DJ is dressed, whether it is a full Tuxedo / suit or very smart trousers and shirt, or branded work-wear. First impressions are a lasting impression on all. Will Your DJs sound system be adequate enough for Party / Event? Your DJ should be able to provide you a state of the art sound system giving crystal clear [stereo] sound without any feedback or distortion … having total control over any volume levels where appropriate also ensuring that any system is setup professionally – neat and tidy. Will the DJs equipment be setup before any guests arrive? It is always good to give the DJ at least an hour minimum to setup their equipment, sometimes even longer as there is nothing worse than the DJs gear all over the place whilst your guests arrive. Another thing to ask your DJ is do they offer an early setup [you may incur an extra charge for this service]. Will your DJ have a professional looking setup? There are to many horror stories of DJs who setup using crates or venue tables with a dirty cloth thrown over the top and wires trailing all over the place – this does not look good at all and can be very hazardous. 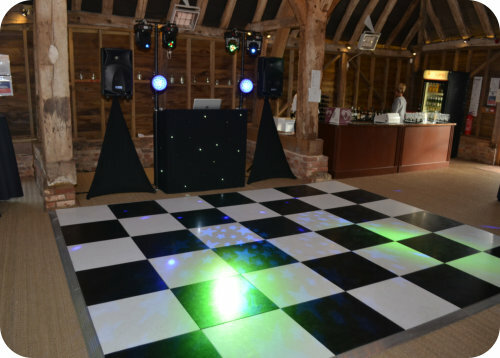 Most professional DJs will have a dedicated or custom built DJ booth, stand or unit – this will hide and keep everything tidy – not only that, it looks professional and looks great in any photos – especially the ‘first dance’. All cables and fixings should be neat, tidy and secure to prevent any accidents or miss-haps. Can we meet our DJ before our Wedding day or Party? It is highly recommended that you arrange to meet with your potential DJ before your Wedding day or party. This is always a good thing because it gives you the opportunity to meet the DJ in person and Interview them, giving you an even more informed decision and you also get to ask any questions or raise any concerns that you may have. This is also a good opportunity for the DJ to show you their paperwork like PLI [public liability Insurance], PAT Certificates and Pro Dub License etc. The DJ can also explain any terms and conditions they have in place as well as their contract for a booking – they should also explain how their booking process works in terms of a non-refundable reservation fee or deposit terms. You should also be under ‘no obligation’ to book there and then, but have time to look at any contracts and consider any quotes tendered. Good places to meet are at the venue or location of your Wedding or party [if permitted], otherwise at your home or a more convenient or public place. Does your DJ provide any terms and conditions and a contract? This should be a must for any event booked … Not only will this give you peace of mind and be legally binding, but it is also a guarantee of service and in the event that your party or event does not go ahead due to unforeseen circumstances – you can then refer to the contract for your own peace of mind and for any claims to be made against your own party or event Insurance policies. Always read the ‘small print’ of any contract before you sign on the dotted line. Should I pay a deposit or a non-refundable reservation fee? Again, this should be part of any terms and conditions of a booking [please read all the small print]. By accepting the terms and conditions and paying a deposit or non-refundable reservation fee, you are securing your date with the DJ … too many times we hear of Clients that give a date to a DJ and think that it is set-in-stone … remember, no date is secure unless you pay your deposit or non-refundable reservation fee. As an example: I would take a date into consideration if it is available, then I would look to arrange a meeting or send out my terms and conditions along with my contract for the prospective client to read through … if they are happy to book my services I would then require the contract to be sent back signed along with any deposit or non-refundable reservation fee to secure their booking. If I do not hear from the client within 14 days I would send a gentle reminder informing them that the date is only pencilled in and not secure until a deposit or non-refundable reservation fee is paid … if two weeks pass and I hear nothing, then the date is released and open for any new enquiries – if also within those two weeks I get another enquiry for the same date, I would then inform the first enquirer and give them first refusal – if however I hear nothing back within 48hrs I will then look to release the date to the new enquirer if they book as per terms and conditions. Will the DJ play the music that we want to hear? Any professional DJ should offer a music request play-list option and also a play-list of songs you do not want played [for any number of reasons]. One thing you should also consider is that your friends, family and guests may want to request songs on the day/night of your party and any professional DJ should be able to cater for such things and also take into consideration any play-lists supplied and songs not to play. All too often the DJ will get pestered to play a song immediately etc. Any professional DJ should be able to react to this and do the appropriate thing in response – by being polite and courteous and playing the requested song if it fits within the guidelines of the party and at a convenient time and in timing with the current dance floor flow… any good DJ should be able to ‘read a dance floor’ and create a great atmosphere. Sometimes clients insist on supplying a set play list that has to be played in a specific order – this all to often kills the party and creates a bad atmosphere amongst your guests… you should always let the DJ work from any play-lists provided by using their professional judgement, they will endeavour to play the songs at the appropriate times. If there are any special request songs to be played, please give the DJ plenty of time to source any ‘hard to find’ songs or the correct versions of songs for say a first dance or special dedication. Other things to consider or take into consideration are explicit songs or songs not suitable for a party or event … most professional DJs should be able to source explicit free songs in the form of radio-edits / explicit free or professional DJ resources specialising in this type of content. Is the DJ’s music library adequate, current and legal? Will the DJ advertise their business at your event? This decision should be down to you – we feel it does not look very professional with banners or signs advertising the DJs business at a Wedding or Party. By all means allow your DJ to give out a business card if they are asked for one by a friend, family or guest – but again, this decision should be yours to make… remember, many DJs work is gained from referrals at Weddings and other parties… you may well have been referred a DJ for your special day. Do you want your DJ to be cheesy, have personality or be formal? This again should be your decision … do you want your DJ to be funny and out-going with a sense of humour engaging with your audience? Or do you want your DJ to be formal and only speak on the microphone when necessary for announcements or dedications? By meeting with your DJ prior to any event, you can discuss these subjects in detail and get an idea of the type of DJ you would like. Any good DJ should know how to engage their audience in a professional manner. Will the music be too loud, affecting my guests who would still like to chat? Any professional DJ should try and keep the music at a comfortable level – especially during a Wedding breakfast for background music. As the main reception or party starts, the music will typically get louder but in proportion to the amount of guests and directed only within the dance floor area and not projected to the back of the room or seating areas [unless otherwise agreed]. By adhering to this your guests should still be able to talk and hear each other away from the dance floor. Some venues will have in place a sound limiter or decibel meter [under their license agreements] so in effect if you wanted the music to be louder – this cannot happen because of the sound limiter in place and the venues music license policy. Also note, some DJs will not work at a venue that has a sound limiter or decibel meter installed, as these systems can effect and/or damage the electronics within the DJ’s equipment if the power is cut! Does your DJ provide disco lighting? Smoke or venue mood / up-lighting? 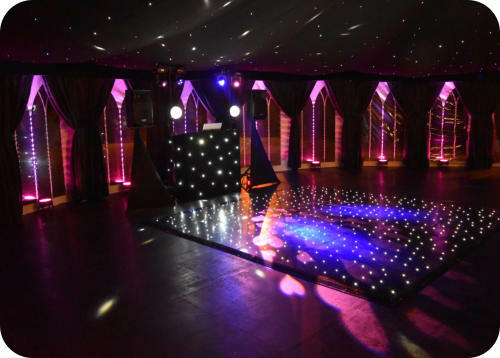 Lighting should be available to you for your event if required, especially for the disco element – as this will provide a great atmosphere and visual experience for your party. Always discuss with your DJ the type of lighting that is on offer and also consider any health conditions and hazard issues such as Epilepsy or Photosensitive reactions to strobe lights or flickering lights. Venue mood / up-lighting can help transform your venue surround, walls and ceilings by colour matching your Wedding theme and colours or giving that extra special look to a party theme – try and get the DJ to give you a demo or show you some photos of this type of lighting. Lasers can have a great effect on a party and create amazing laser-light shows, but do remember there are strict guidelines when using certain lasers at events and these must be adhered to at all times to prevent any injury to the public – always talk to your DJ regards these matters. Smoke, haze and low fog/dry ice machines are a wonderful addition to any party and will bring any disco lighting to life – however some venues will not permit the use of such things because of fire alarm and sprinkler sensors – always discuss with your DJ and the venue in respect to such matters and their guidelines in place. Bubble machines are also quite popular – but some venues do not allow the use of these machines due to wet floors or staff/guests slipping – always check with your venue first before arranging these types of services. Sometimes a risk assessment has to be done before any such service can be provided. Do we have to feed our DJ? No, you are not obliged to feed the DJ but it may be worth taking into consideration if the DJ is going to be there all day, from early setup to finish/break down… sometimes the DJ is committed to long days and some Wedding events for a DJ can be over 16hrs on-site. Often DJs will bring their own supply of food and drink as they don’t want to inflict on your Wedding budget – if however you are happy to feed your DJ then discuss this with the DJ and venue – sometimes a venue will feed and supply a DJ with a plate of sandwiches and bottles of water. Does the DJ have a back-up plan or equipment? Any professional DJ should have a back-up plan in place and always have a fail-safe when it comes to their equipment. Most professional DJs will have secondary equipment at hand [or stored in the car/van]… in the event of an equipment failure. The DJ should also have in place a back-up or emergency playback system for their music library, in most cases a back-up laptop or media player.. Does your DJ have a back-up DJ should the need arise? Any professional DJ should be a member of a recognised DJ Association or organisation like SEDA, NADJ, AmpDJ etc. and in the event that the DJ needs a back-up DJ he can call upon these other professional DJs who are members of these organisations and arrange the necessary cover. Do we have to use the venues resident DJ? No, you are under no obligation to do so unless it specifically states this in the venues terms and conditions of hire – and if it is the latter and you still want to use your own preferred DJ, you may have to consider changing venues. If you do go ahead and use the venues resident DJ, insist that you deal with them directly regarding any plans for your entertainment – do not rely on the venue to pass on details etc. All too often you are led to believe that you have to use the resident DJ for your Wedding or party – this is not always the case and you should stand your ground and insist that you will use your own entertainment choices. Some venues will allow this but may charge you extra fee and will no doubt insist on seeing the DJs PLI, PAT and Pro Dub License documents. If you feel that the venue is restricting you on your vendor choices, ask why and insist that fair trade and competition is open to all - if in doubt speak to your local Authority and Trading Standards, and inform the venue of your intentions. Have you forgotten to ask anything not listed here? It can be very daunting booking a DJ if you have had no experience of doing so before … anything can look good on paper but we strongly recommend and encourage you to look around, asking friends and colleagues for recommendations etc. Talk with other service professionals you are working with – event planners, photographers etc. Always ask to see your DJ’s documents – any professional DJ should be able to show proof of: Public Liability Insurance – Employers Liability Insurance [if required] – Portable Appliance Test Certificates [PAT] for their DJ equipment – Pro Dub License for copied/format shifted music – Full Terms & Conditions and Full Contracts – Full Invoicing etc. When looking to book your DJ it is advisable to give as much information as possible: The venue or location of your Wedding or party and the date of your Wedding or party event. Give your full name and contact address, telephone number or email address, also giving the start and finish times [is an early setup required]. What services you require or looking into hiring etc. The more details you can give the DJ the better – this way they can compile their bespoke and tailored quote for your party. “If you choose a DJ based upon price alone, you are setting yourself up for a train wreck to happen. Professional DJs are not selling ‘things’, they are selling value, fun and a memorable experiences … after all, you are only looking to get married once, so why take any chances.” Thank you for taking the time to read these tips – if you have any more questions then please do get in touch. Glenn Nash This document was created using various sources and personal experience as a professional DJ in the Wedding and Party Industry. have experience of Weddings and Parties? Is Your DJ registered self employed? And registered with HMRC with a ‘Unique Tax Code’ [UTC] If they are a Ltd company or PLC, are they registered at Companies House? Is this a part-time job or ‘hobby’ for the DJ? Some DJs may well have a full- time day job of which their DJ work is subsidised by this … how does this affect a full-time professional DJ? Well some but not all will charge a lower fee because they don’t rely on DJ work income and others – the ‘hobbyist DJ or bedroom DJ’ may not declare their second income to HMRC … this then makes it hard for a full-time professional Wedding DJ to earn a living and it also affects You as a ‘Tax Payer’. How many Weddings and parties have they undertaken and do they have any references, feedback or testimonials to show you? Any professional DJ should offer a music request play-list option and also a play-list of songs you do not want played [for any number of reasons]. One thing you should also consider is that your friends, family and guests may want to request songs on the day/night of your party and any professional DJ should be able to cater for such things and also take into consideration any play-lists supplied and songs not to play. All too often the DJ will get pestered to play a song immediately etc. Any professional DJ should be able to react to this and do the appropriate thing in response – by being polite and courteous and playing the requested song if it fits within the guidelines of the party and at a convenient time and in timing with the current dance floor flow… any good DJ should be able to ‘read a dance floor’ and create a great atmosphere. Sometimes clients insist on supplying a set play-list that has to be played in a specific order – this all to often kills the party and creates a bad atmosphere amongst your guests… you should always let the DJ work from any play-lists provided by using their professional judgement, they will endeavour to play the songs at the appropriate times. If there are any special request songs to be played, please give the DJ plenty of time to source any ‘hard to find’ songs or the correct versions of songs for say a first dance or special dedication. Other things to consider or take into consideration are explicit songs or songs not suitable for a party or event … most professional DJs should be able to source explicit free songs in the form of radio-edits / explicit free or professional DJ resources specialising in this type of content.